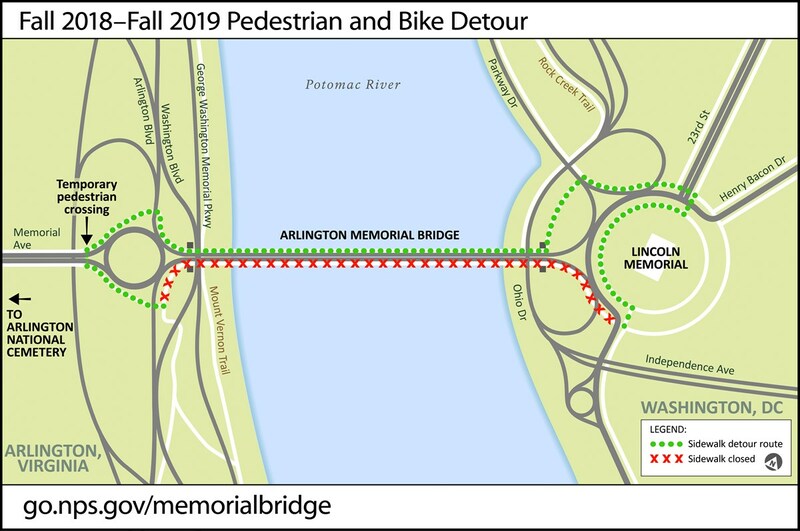 The region will feel a major shift in bridge traffic as a three-year construction plan for the Arlington Memorial Bridge begins October 15. 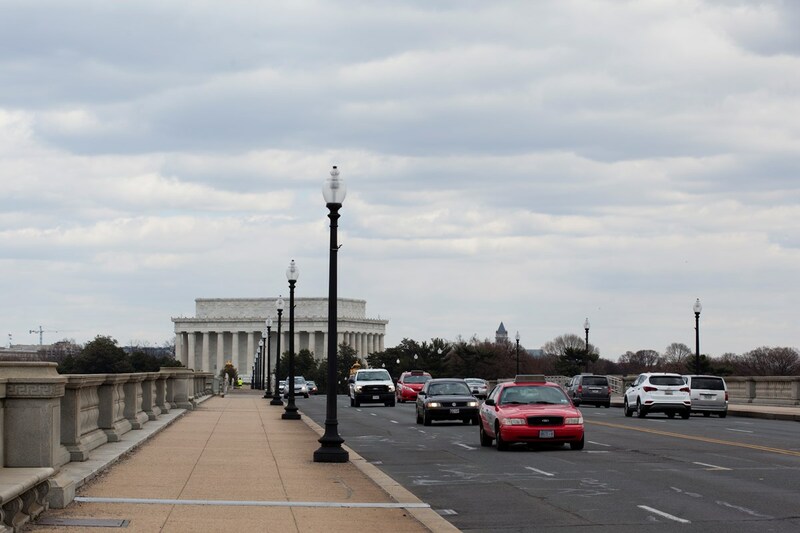 Major renovation of the Arlington Memorial Bridge connecting Arlington to D.C. will change the flow of traffic for thousands of commuters. What was formerly six lanes of traffic is being narrowed to three, with one lane each way and one reversible lane moving in the direction of rush-hour flow (into D.C. from 4 a.m.-12 p.m., out to Virginia from 12 p.m. through the overnight hours). This will potentially impact the volume on the nearby Key and 14th Street bridges as drivers seek alternate routes. The scope of this project will affect motorists, pedestrians, and cyclists for the next three years until its completion in 2021. Those who walk or cycle across the bridge will now only have one side to do so. The westbound sidewalk and bike lane will be closed. Keep an eye out for directional signage as the construction work may necessitate sporadic changes in the walk and bike lane locations. Access points for both pedestrians and cyclists will be available from the Mount Vernon Trail, Metro, or Arlington National Cemetery from Virginia. See below for a map from the National Park Service about the incoming pedestrian and cyclist on-ramp locations for the bridge. The water under the bridge will also be affected by the bridge construction. 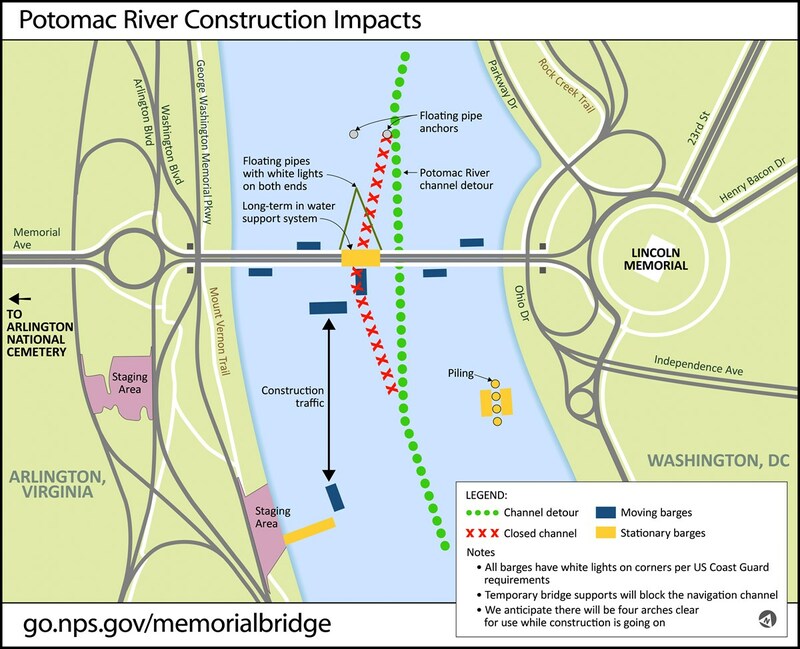 Materials and equipment will be staged on barges underneath and adjacent to the bridge, and boaters should be aware of channel closures when near the Arlington Memorial Bridge. See below for a preliminary graphic about the early stage water routes with detours. For additional information about the bridge construction project or updates on major traffic route changes, visit the National Park Service website. Will these construction changes affect your commute? What alternate routes are you eyeing to make your trip into the city a little easier? Let us know in the comments below. Here's where you can get the best view of the Marine Corps Marathon!